The iconic Krugerrand, regarded by many as the coin that started modern gold coin collecting, celebrates its 50th anniversary in 2017 since it was first struck on 3 July 1967. To celebrate the enduring value of this trusted and legendary icon, it has been produced for the first time in different metals, as well as different denominations in 2017. The common reverse on the 2017-dated Krugerrands features South Africa’s national animal, the springbok, as designed and engraved by sculptor Coert Steynberg and first used on the 1947 5-shilling coin. 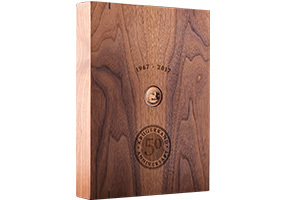 They also all bear a ‘50th anniversary’ privy mark to commemorate the enduring value of this internationally recognised brand. Utilising the brilliant lustre of the purest silver available, the silver 1 oz proof features unparalleled gloss that highlights the distinctive Krugerrand design, making it an irresistible addition to any collection. 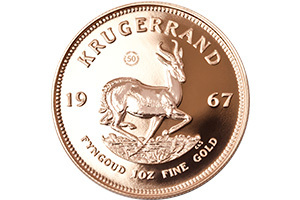 As with the original gold coin minted on 3 July 1967, the silver Krugerrand range bears the undeniable weight of the Krugerrand legacy and carries it forward with superior technological advancements. Each coin is hand positioned and pressed several times at a lower weight, allowing for immaculate transfer of detail and ensuring a truly beautiful gloss every time. 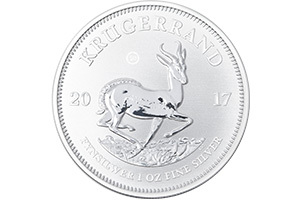 The 1 oz silver Premium Uncirculated coin is a visually striking addition to any Krugerrand collection. Crafted with the latest technology, it perfectly demonstrates the highlights, shading and gloss that can be executed in a pure silver coin. All silver Krugerrands are minted with only the best fine silver and with 1 million units launched in 2017, it embodies both accessibility and exclusivity. 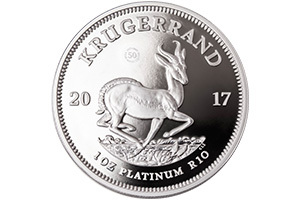 To mark the 50th anniversary of the first pressing of the Krugerrand, we premier the new and inimitable 1 oz platinum proof coin. Minted with the R10 denomination, this 1 oz proof coin is the first South African legal tender produced in platinum. This, paired with the limited production run makes this coin one of the most valuable collector’s coins in the Krugerrand family. The introduction of this ground-breaking coin sets the stage for an illustrious future in diverse collectible coins. 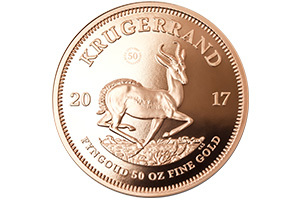 With an ounce for every decade in the legacy of the Krugerrand, the new 5 oz gold proof coin adds weight and significance to the Krugerrand family. The 2017 proof coins are hand positioned and pressed five times at a lower weight, allowing for the immaculate transfer of detail. 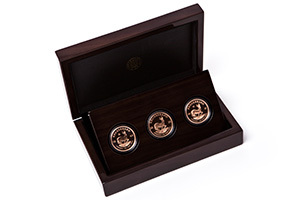 Proof coins are hand packed and encapsulated to maintain mint condition. The 1967 vintage 1 oz coin is a re-issue of the original, carrying the prestige of the full 50 years of Krugerrand craft and distinction. First minted on the 3rd of July 1967, it set what can be understood as the new global gold standard. Every 1 oz gold Krugerrand has 1 troy ounce of gold. 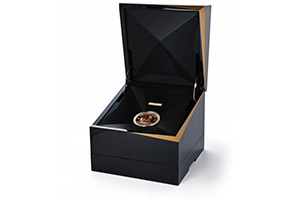 This collector’s coin amplifies the craft and technique associated with the original bullion coin. The 2017 proof coins are hand positioned and pressed several times at a lower weight, allowing for immaculate transfer of detail and finishing. 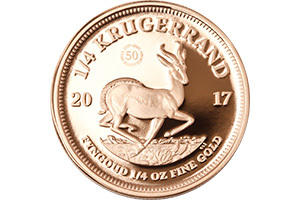 Every 1 oz gold proof Krugerrand has 1 troy ounce of gold. 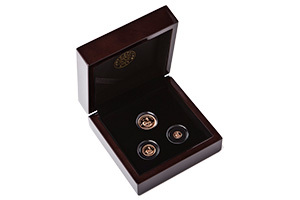 Proof coins are hand packed and encapsulated to maintain mint condition. 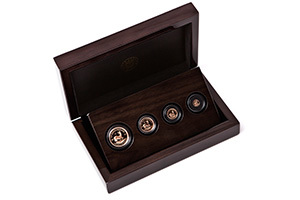 As one of the classic members of the Krugerrand family, the 50th anniversary 1/2 oz gold proof coin stands as testament to the legacy of craftsmanship expected by collectors the world over. 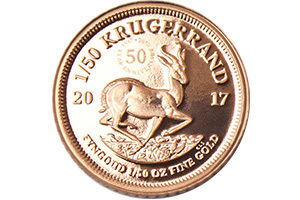 As the first step towards making the Krugerrand even more accessible, this is one of the three coins, which laid the foundation for all subsequent fractional editions. 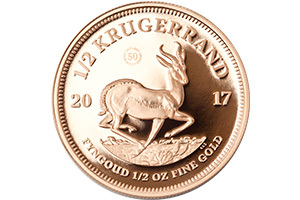 With delicacy of design backed by generations of craftsmanship, the 1/4 oz gold proof coin forms an integral part of the Krugerrand family and a pillar of any coin collection. As one of the iconic members of the Krugerrand family, the 1/10 oz gold proof coin brings together tradition, craftsmanship, and distinction making it the perfect homage to 50 years of superlative coin design. 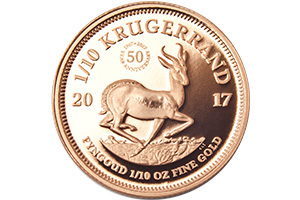 Previously the smallest in the Krugerrand coin range; the 1/10 oz coin is now followed by two smaller coins in the 50th anniversary range. With ever evolving technology and a legacy of unrivalled craftsmanship, we introduce a new size in the 1/20 oz gold proof Krugerrand: the delicate and intricate tribute to 50 years of iconic collector’s coins. 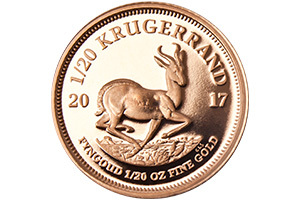 The fractional coins acknowledge the original intention of the Krugerrand as the means of enabling gold ownership among everyday people and with the expansion to the 1/20 oz, this ideal is made even more attainable. With the introduction of the once-off 1/50 oz gold proof coin, we provide a glimpse at the future of intricacy and artistry while commemorating 50 years of ever evolving craftsmanship and integrity. As the most accessible addition to the Krugerrand family, the 1/50 oz gold proof coin focuses on perfecting intricate and highly detailed artistry while remaining true to the Krugerrand coin. The new 1/50 oz is an absolute novelty that will only be produced for the 50th anniversary of the Krugerrand. This set is literally the smallest collection for 2017 and easily provides the opportunity to own a collection set at an affordable price. It is comprised of the traditional 1/10 oz coin joined by the new 1/20 and 1/50 coins. 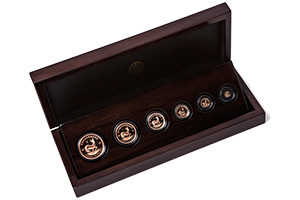 This remarkable set in the Krugerrand collection makes the ownership of a rare Krugerrand set within reach to even more collectors, with the combination of the smallest Krugerrands. The artistic process and craftsmanship behind the minting of these coins imbue them with exquisite detail that is amplified by their minute size and weight. The current theme, ‘South African inventions’, was launched in 2016, the dolos being the first invention to be featured. The year 2017 marks the 50th anniversary of the first successful human-to-human heart transplant, performed by a team of around 30 surgeons – led by Dr Christiaan Neethling Barnard – in the Groote Schuur Hospital in Cape Town on 3 December 1967. 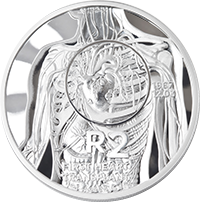 The reverse of the R2 crown depicts a human torso indicating the position of the heart, the denomination, the words ‘First heart transplant’, and the year ‘1967’. 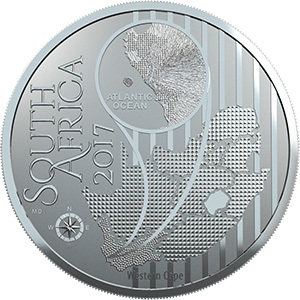 The obverse features the coat of arms of South Africa, the year ‘2017’, and the words ‘South Africa’ in all the official languages. 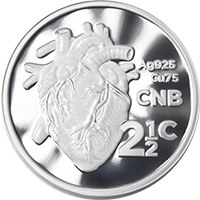 The reverse of the 2½c tickey shows a human heart, the denomination, and ‘CNB’, while the obverse features the words ‘South Africa’, ‘2017’, and a King Protea. 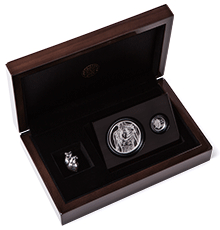 The full 2017 & Sterling-Silver Crown and Tickey set is comprised of a R2 crown-sized coin, a 2 ½ c Tickey coin and a sterling-silver model of human heart, packaged in a beautiful piano finish varnish, walnut wood box. The Crown obverse depicts the coat of arms of South Africa, the year ‘2017’, and the words ‘South Africa’ in all the official languages. 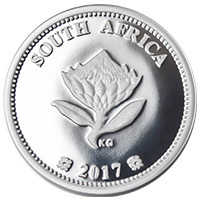 The Tickey obverse features the words ‘South Africa’, the year ‘2017’ and a King Protea. ‘Comrade OR’, as he was affectionately known, was a founding member of the African National Congress (ANC) Youth League and between 1944 and his untimely passing in 1993, took on various leadership roles in the party including General Secretary, National Chairperson, Deputy President and President. Although ‘Comrade OR’ did not fully experience the liberated and democratic dispensation we now enjoy, he spent the better part of his life standing up for those very ideals – for this, his legacy lives on. 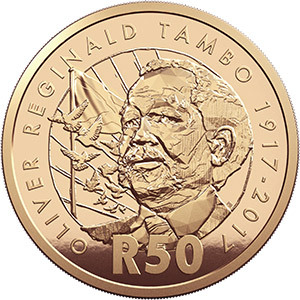 The series consists of a 1 oz pure-gold R500 proof coin, a 1 oz sterling-silver R50 proof coin, a base-metal R50 non-circulating legal tender coin and a R5 commemorative circulation coin. 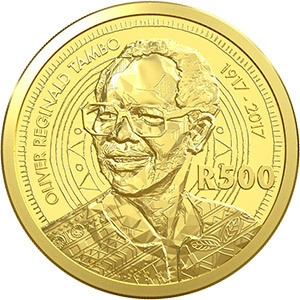 This set consists of three of the OR Tambo commemorative coins: a 1 oz sterling-silver R50 proof coin, the base-metal R50 base metal coin and the proof quality commemorative R5 coin. NB: The R5 commemorative proof coin can only be found in the 4 coin set, and is not sold on its own. 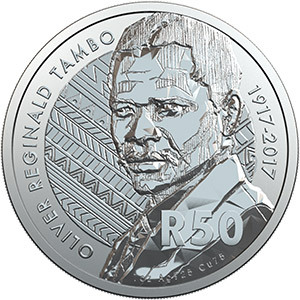 Unlike the circulation commemorative R5 coin, this coin is of a premium quality (proof), and comes in a capsule, which the circulating R5 does not. 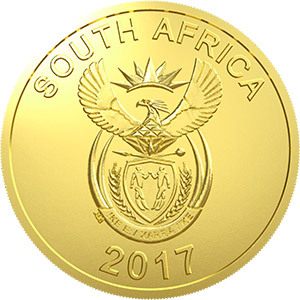 The obverse depicts the national coat of arms, the year of issue ‘2017’, and the words ‘South Africa’. 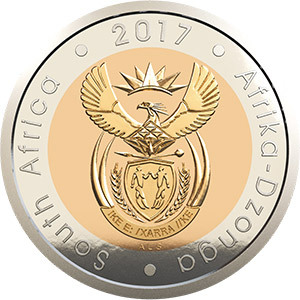 The obverse of the coin depicts the national coat of arms, year of issue ‘2017’, and the words ‘South Africa’ written in all the official languages. 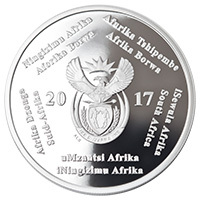 The obverse depicts the national coat of arms, year of issue ‘2017’, and ‘South Africa’ written in both English and Xitsonga. The 2017 colour coin range celebrates the rich diversity and astounding beauty of the Cape West Coast Biosphere, situated in the coastal zone north of Cape Town. The reserve is known for its diverse ecosystems and habitats which include marine, beach and frontal dune environments, pans, wetlands and rocky outcrops. This range is made up of four coins; two R10 sterling-silver coins depicting the fauna and two R5 sterling-silver 1 oz coins depicting the flora of the Cape West Coast Biosphere Reserve. The Caspian tern, the largest of its kind, has a heavy coral-coloured bill that makes it easily identifiable and a fitting inclusion in the 2017 colour coin range. 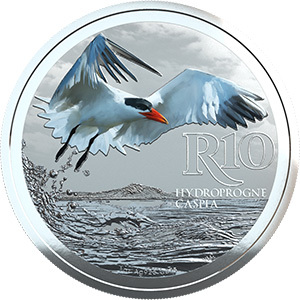 The R10 coin portrays the bird flapping its wings on the reverse. Also depicted on the coin are its scientific name ‘Hydroprogne caspia’, the denomination ‘R10’, and the metal value ‘1 oz Ag 925 Cu 75’. The blue crane is a truly dynamic bird. Its distinctive feathers stretch upward when it feels threatened or excited and its extended wing feathers, known as tertials, trail on the ground and are often mistaken for regal tail feathers. 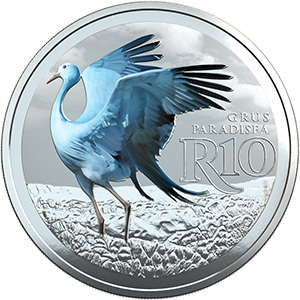 The R10 coin features the near-endemic national bird of South Africa imposingly spreading its wings. On the reverse is also the bird’s scientific name ‘Grus paradisea’, the denomination ‘R10’, and the metal value ‘1 oz Ag 925 Cu 75’. The Mature Startfish Lily, an alien-looking flower with its frilly edges, could easily be mistaken for an exotic sea creature. The fully opened creamy white flowers with brown ruffled edges and chocolate-brown to deep purple spots, highlighted with striking orange anthers. The plant has fleshy sword-like leaves and the flowers have a sweet aroma that reminds vaguely of vanilla. 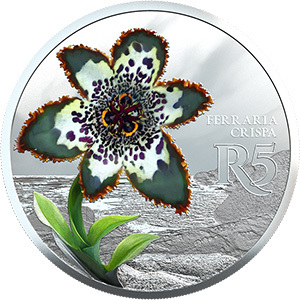 The reverse of this R5 coin features this flower of the Western Strandveld biome, along with its scientific name ‘Ferraria Crispa’ , the denomination ‘R5’, and the metal value ‘1 oz Ag 925 Cu 75’. The yellow wine cup, which blooms in early spring, has deep creamy-yellow cups with dark red-brown centres. The flowers only open fully on hot, still days and are native to the seasonally wet flats of Darling in the Western Cape. 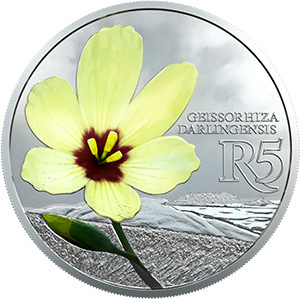 This R5 coin depicts the yellow wine cup against the background of the renosterveld; along with its scientific name ‘Geissorhiza darlingensis’, the denomination ‘R5’, and the metal value ‘1 oz Ag 925 Cu 75’. The second installation of the Colour Coin range, sees the introduction of a full set. 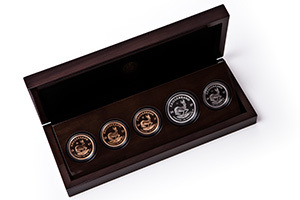 The prestige set consists of all four coins; two R10 sterling-silver 1 oz coins depicting the fauna and two R5 sterling-silver 1 oz coins depicting the flora of the Cape West Coast Biosphere Reserve. The common obverses features a map of South Africa indicating the location of the Cape West Coast Biosphere Reserve together with the words ‘South Africa’ and the year ‘2017’.